Heat the oil and cook the onion, leek, green pepper, garlic, celery, and carrot until tender, about 3 minutes. Add the tomato and cook 3 minutes. add the tomato paste, rish fumet, wine, lemon juice, and bay leaf. Simmer 30 minutes. Remove the bay leaf. Add the fresh herbs and correct seasoning. Set aside. Clean and steam the mussels and clams in the water until the shells open. Save the cooking liquid and strain it through cheesecloth. Add the cooking liquid to the sauce. Add the fish and simmer 3 minutes. Add the shrimp and scallops and simmer 2 minutes. Add the hot sauce and return the mussels and clmas to the pot; heat 1 minute. Divide the fish and shellfish evenly into warmed soup bowls. Ladle the sauce over the seafood and sprinkle with parsley. Chef: shellfish nicely cooked, opened nice. Broth alright, but needs more shine and red color, would be nice to see herbs. Carrots probably too big for the soup, not consistent sizes. Personal/Team: the flavor of the broth was good, but it had an off-brown sort of color that was not attractive, a more red tomato color would look better. Should have garnished with fresh herbs. Seafood was good, I could have done withouth the halibut, just the shellfish. 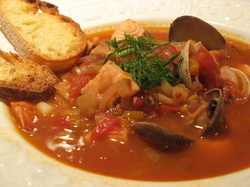 Lessons Learned: You want to serve cioppino with a good crusty bread to soak up the broth in the dish. As always, keep knife cuts consistant in vegetable cuts.